Earthquakes are a major threat to museums and their contents worldwide. However, European museums host a large portion of the most significant world cultural heritage. The protection of museums and their treasures against earthquakes is, therefore, a priority, particularly to assure community resiliency. 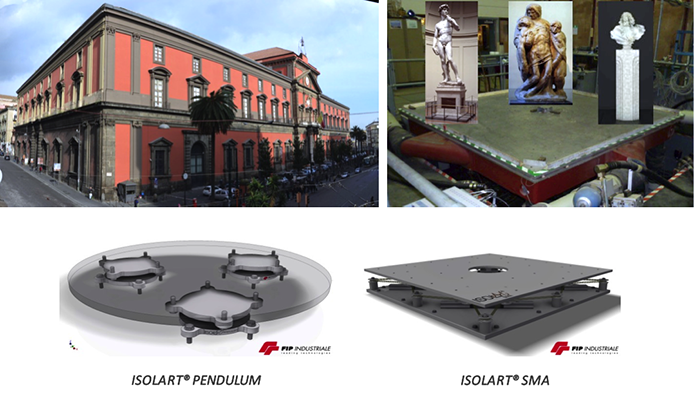 The SEREME project will study the seismic behaviour of museum assets and will propose novel and cost-effective risk mitigation schemes for improving the seismic resilience of European museums. In this regard, artefacts, mainly statues, of different sizes and configurations will be tested on the 6-dof shaking table at the Earthquake and Large Structures Laboratory (EQUALS) at the University of Bristol (UK). Today most museums are located in historical buildings at the centres of European cities. The SEREME project will consider two case-study museums, a typical Italian museum building with a masonry structural system and a reinforced concrete museum building in Greece. Strong ground motion records of different amplitudes will be applied to numerical models of these structures and the acceleration response histories at different locations along the plan/height of the building will be calculated numerically and used as acceleration input for the shake table tests. A Museum Virtual Exhibition Room (MVER) will be created on the 6-dof shaking table. The MVER will contain exhibits such as sculptures and artefacts of different sizes and geometries. The project will first examine the seismic behaviour of the test specimens absent seismic protection (in other words, their most common installation). The tests will be repeated using different seismic protective measures, emphasising the use of low-mass base isolation systems. Two new and highly efficient base isolation systems, tailored to art objects, will be extensively tested for the first time. The first isolator is a pendulum-based system, while the second utilises Shape Memory Alloy wires. These experiments will allow a direct comparison, in a controlled laboratory setting, of the resilience of the seismically protected artefacts with those artefacts that are not protected. The project will develop and calibrate novel numerical models for single- and two- block rocking systems, while experimental and numerical results will be combined in order to develop quick overturning assessment criteria. The final task of SEREME will combine the shaking table experimental outcomes with numerical results, obtained from calibrated models, in order to develop fragility curves for museum artefacts. Moreover, pre-normative guidelines for the seismic assessment and retrofitting of artefacts will also be proposed.